Bringing inventors into the development of new products and services can have a large impact on the economic success of an area. 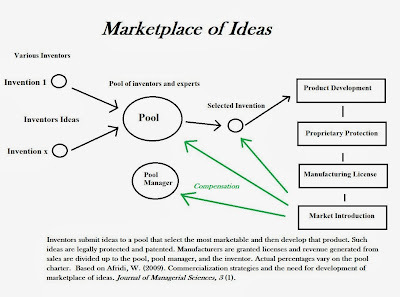 A paper by Dr. Waleed Khan Afridi delves into a method commercializing inventions through associated pools in a way that protects the parties involved as well as gives the best opportunity for eventual manufacturing. He argues that small inventors should support each other in the development of products and share some of the financial benefits of the process. Even though businesses and employees generate a number of new products or services many of them do not make their way into the market. The biggest barrier is the cost of development related to the evaluation of marketability, patentability, and technical feasibility. Even those who traverse the many steps to putting their product on the market are not guaranteed success making the risks versus reward difficult. When new product ideas are created they can be sent to a pool where they are evaluated for possibilities. At this point those that are selected can move through design engineering so that each concept can be evaluated for its marketability, patentability and technical feasibility. After determining its potential feasibility and market potential it is developed into a model product. Of course, products must be protected through the use of appropriate patents. Once the patent is created it is possible to move the protected product to interested manufactures who will seek the right to build, sell, and own the product. 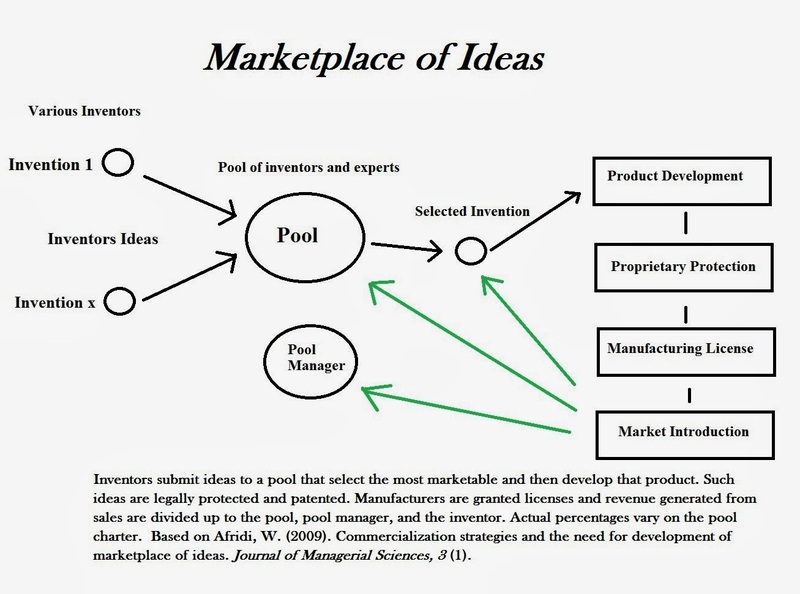 Revenues from the patent make their way back to the person who invented it, the pool that developed it, and the managers who helped patent it. The author advocates a process whereby all interested parties receive some percentage of the profits. The author doesn’t state this concept but it would appear that such concepts may work within incubator hubs where entrepreneurs may work together to develop products and display them to companies that are interested. Small firms and entrepreneurs often don’t have much experience in developing products and moving through the process to commercialization. By having people work in a group or pool they can hedge their skills and abilities while working together to create something beneficial. Each incubator could have their own pool that evaluates and promotes work. One problem faced by small investors is the idea of intellectual property theft. The author highlights a story of an inventor who developed a new windshield wiper and brought it to the attention of automotive executives. His idea was refused but then a similar product came out and the inventor had to fight for his royalties. Trust between inventors and manufactures needs to be maintained if new ideas are expected to be fostered and forthcoming. The manufacturing of ideas is also expensive and many products would simply be underdeveloped or thrown out in history unless a partnership between those who invent and those who build is maintained. The development of products through groups of inventors helps protect them and further collectivize their knowledge for growth. Likewise the patenting process is easier to navigate in a team due to its complex and costly structure. Larger organizations are encouraged to take on some of the best ideas with appropriate protections for all parties involved. Afridi, W. (2009). Commercialization strategies and the need for development of marketplace of ideas. Journal of Managerial Sciences, 3 (1).